Hotdogs and hotdog stands are popular almost everywhere, but I don't think anywhere takes the concept of sausage and bread as seriously as the Danes. 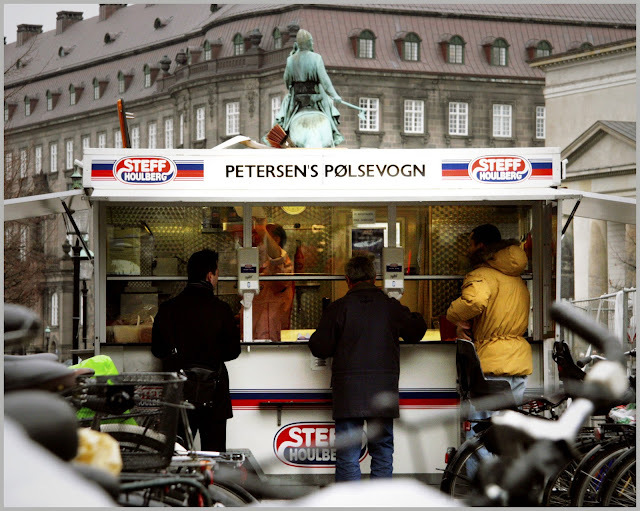 A Danish hotdog stand called a pølsevogn can be found on almost any major street or torv in Denmark. Much larger and more involved than a typical North American hotdog cart, the pølsevogn is more like an outdoor mobile kitchen along the lines on an imbiss in Germany. 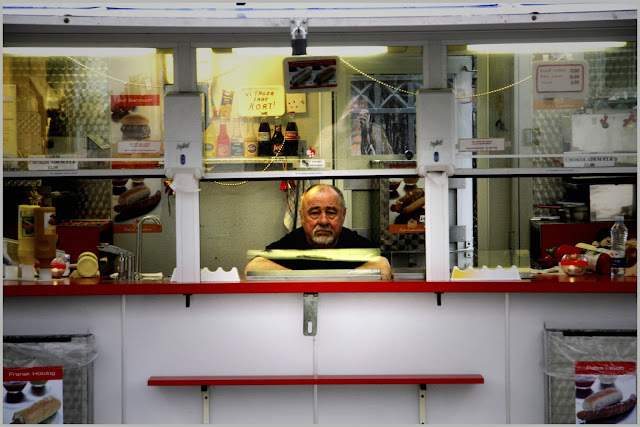 The first hotdogs were officially sold on the street in 1910 and quickly grew in popularity. There were over 400 pølsevogn in Copenhagen by the 1950's. 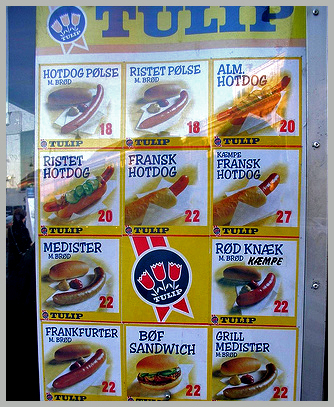 Rødpølser one of the first types of hotdog sold, is a long skinny wiener that was originally dipped in red dye as to hide the fact that they could be "day old" and looked more fresh. They are still traditionally dyed that colour today and over 100 million are eaten each year in Denmark. Pretty impressive for a country of 5.5 million! Pølservogn menus are fairly standard and posted with pictures on the side of the stand. 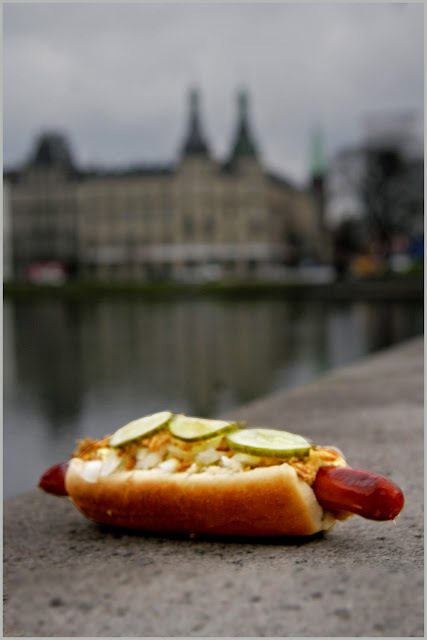 The first time I ordered a hotdog p﻿ølse in Copenhagen they asked me if I wanted bread. I said "of course" having never eaten a hotdog that wasn't in a bun. When I got this tiny dinner roll on the side I couldn't help but laugh out loud, but this is how most sausages are served. Whatever sausage you choose comes on a plate with a squirt of mustard and hotdog ketchup (a ketchup with a texture and flavour that's unique) and a bun on the side. 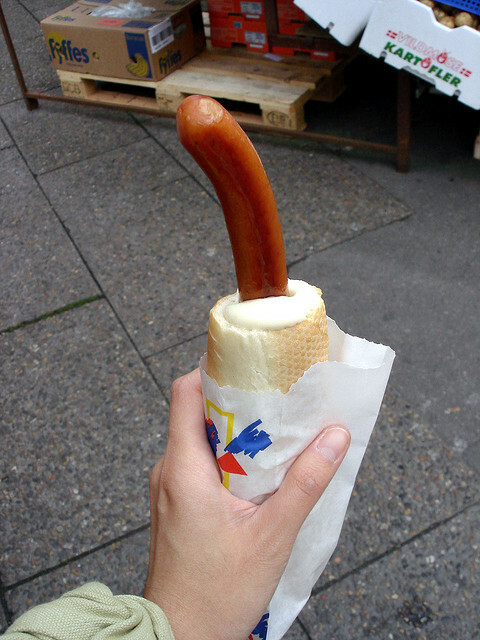 ﻿﻿ Possibly the most popular item sold is a fransk dog which is a hollowed out baguette filled with a special tangy mayo and a hotdog stuffed inside. 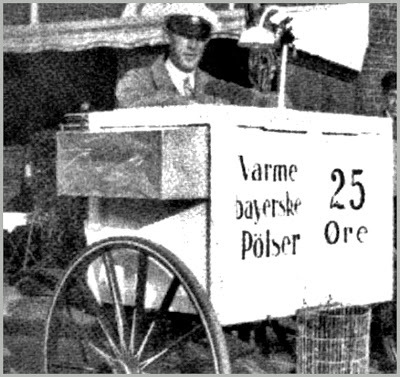 A pølsevogn is usually motorized and can be driven from place to place. In the mornings these slow moving vehicles can cause traffic jams, but everyone seems to except it as part of city life. 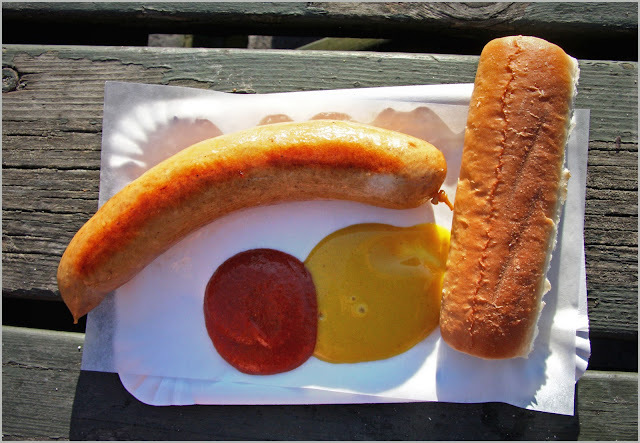 here is a video of a typical Danish hotdog stand. Thank God for the polsevogen! In Copenhagen with two young sons, polsefransk was about the only thing they would eat! Well well ... how nice it was .. I went back for seconds it was so good. The little sausage carts are conveniently located in central Copenhagen and the Medister only costs about $5 ... a very cheap snack/meal. I will be back for more when next in Copenhagen. @Geoff Oh a daring choice! :-D Medister is a pretty hearty sausage for beginners. The usual condiment for it is actually mustard. But mustard + Danish remoulade is an exquisite combination. I will recommend it to everyone who likes medisterpølse. Apart from the remoulade, the Danish mustard is also a bit different. It is unsweetened and hot, but made from simple ingredients. It has a thick consistency and is not sour as Dijon mustard. For me it is the best as a condiment for anything with pork meat. 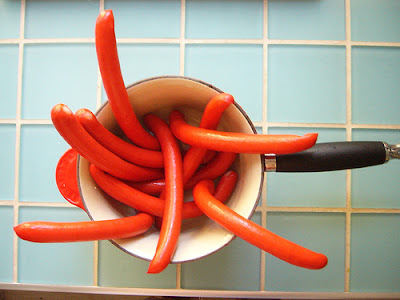 Actually, the red dye on day old sausages was required by law. 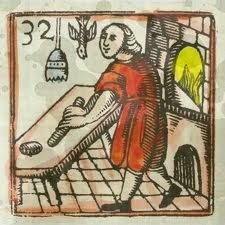 It was an attempt to heighten food safety, rather than an attempt to goldbrick.